This friendly hotel has an enviable location in the heart of Albufeira, in a pedestrian zone in the old part of the city between the park and Fisherman's beach. The property is near a number of bars and restaurants, with the bus station 400 metres and.. Located in the heart of Albufeira, this friendly unit offers self-catering apartments with access to an outdoor swimming pool and a solarium. The property is located in Areais de S. João, just 600 meters from Oura beach (Praia da Oura).No restaurants.. This apartment complex is just a few kilometres from the town centre of Albufeira that features many shopping and entertainment venues. The complex is just 600 m from links to the public transport network and about 1,500 m from the splendid beach. The.. The Algarve has long been a favourite for British Holidaymakers, with Albufeira being well known as Portugal¿s hotspot for sun, sea and sand! This coastal city offers visitors the best of all that Portugal has to offer, with beautiful beaches, traditional.. 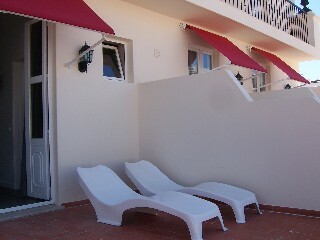 This hotel is located only a short walk from the lively area of Montechoro in Albufeira. Guests will be able to stroll through the various nightclubs, restaurants and other activities in a matter of minutes. The stunning sandy beach is 2.5 km away and..
General Description: Choromar is located 1500 m from a sandy beach. The closest cities to the hotel are Albufeira (2 km), Vilamoura (15 km) and Armacao (15 km). To make your stay more comfortable a mini market, air conditioning, a lobby and a reception.. 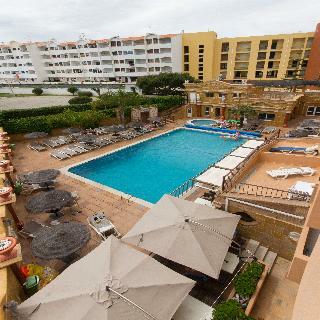 The family run Choromar complex is perfect location for those who want to be just a short walk from the lively Montechoro area of Albufeira but don't want to be right on top of it. You can stroll to the restaurants, clubs, and activities of Strip in leisure..